Obviously a fake prophet, one Timothy Ngwu, a serial adulterer and fornicator claims God told him to impregnate his church members. Timothy Ngwu, the General Overseer of Vineyard Ministry of the Holy Trinity, located at Ihe/Owerre, Nsukka in Enugu State has been arrested by Police in Enugu State. Before his arrest on Friday, the self acclaimed Pastor, who said he was obeying God’s command, has put no less than 20 members of his church in a family way. DailyPost gathered that Ngwu does not spare married women in his evil act. The spokesman of the Enugu State Police Command, Ebere Amaraizu, DSP, disclosed that “the pastor claims to be obeying prophetic/spiritual injunction to do the will of God, which is to impregnate any one chosen and revealed by the Holy Spirit, irrespective of whether the woman is married or not. “When the woman is delivered of the baby, the child remains in the ministry with the mother for life”. Amaraizu added that “Vineyard Ministry of the Holy Trinity, located at Umudikwere, Ihe/Owere Nsukka in Enugu was not known until DSP Gloria Udoka and her operatives from the Anti Child Trafficking unit of the state criminal and investigation department, stormed the place based on the complaint they received from wife of the Pastor, Veronica Ngwu, bordering on sexual abuse of people in the ministry, which has brought about indiscriminate pregnancy among married and single women in the ministry. “According to Veronica, her husband used to be a well known catechist in Nsukka Catholic”. It was further disclosed that while acting under the same alleged will of God, the Pastor got his wife’s niece pregnant. Some of the members’ wives are now living with him after he impregnated all of them”, the statement added. Reacting to the allegations against him, the General Overseer stated that he has about five wives with thirteen children, apart from other concubines, who came as a result of the prophetic will of God. He claimed that he does not do anything with any married woman until full consent and agreement is reached between him and the husband in line with the directives of the holy Spirit. 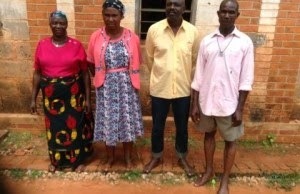 Two of the women, who had left their husband and are now living with the General Overseer, Calista Omeje, and Assumpta Odo confirmed that they left their husband and went to the General Overseer based on the prophetic injunction to do the will of God. Calista revealed that she is married to her husband with ten children, and that she was impregnated by Timothy, though the baby later died. She further disclosed that she also gave her daughter out to the General Overseer to be impregnated in fulfillment of will of God. Assumpta Odo also confirmed the development, pointing out that she is also married with eight children and that the pastor impregnated her as well as her daughter.